I should probably rename my blog, “Sometimes I Cook” because that’s a much, much truer title than my title from my high-school/college yesteryears of “cooking during the breaks” since… well, real life (and not even real-real life, grad-school-real-life, which is not the same as ‘real person’ life) does not really contain ‘breaks’ in which to cook to one’s heart’s content [because I’m either recovering from jet lag; excitedly looking forward to weekends to …catch up on all the work; or enjoying non-Indian food (hello burgers! hello smoked salmon! hello RAW SALAD)]. Which explains the last ~2-3 years. to possibly throw something together today? Sometimes, all of the above comes together, and motivation is sparked. Fresh farmer’s market veggies paired with creamy herby goat cheese over whole wheat penne and tiny multicolored tomatoes — a combo that hints at the closing of summer, and the coming fall. Preheat oven to 400 F. Rinse beets and chard. Cut greens off of the beets and set aside. Spray the beets with coconut oil, or rub a little coconut oil/olive oil/butter all over and place cover each with aluminum foil. Bake for 1 hour or longer; remove when tender if pierced by a fork. Allow to cool and then peel (they should peel easily) and chop into slices or rounds. Set aside. Meanwhile, chop up the beet greens and stalks of the chard into small bite-sized pieces. I left the chard greens out to use as salad, or cook for something else, but you can leave them in if you like. Heat olive oil and butter in a large pan on medium heat. When melted, sprinkle in the cumin seeds and let them brown a little (1-2 minutes). Add the chard and beet greens, toss and sauté until tender. Towards the end of the cooking, add the chopped tomatoes and cook them a little but not too much. Add salt and pepper (if you like pepper, eww, none for me please). Boil water for pasta. I don’t usually add salt but you can if you want. Cook pasta until al dente; drain and toss with the chard/beet mixture. To serve, sprinkle some chopped beets, along with goat cheese, on top of a healthy scoop of pasta/veggies. Sooo delicious. The chard/beet stalks are so tender, and there are so many pretty colors! Plus, the tried-and-true goat cheese/beet combo is just the bomb. I’m obsessed with roasted beets and this just enables the obsession. Basically after everything I bake, I say to myself, okay, no more baking, Sam, because really, it’s just not doing anyone any favors. So many (not everyone [hey if you live close to me please come by and get a piece of cake if you so desire], but lots) of my favorite people kind of live far away, and if I’m not baking cookies, well, it’s hard to mail anything else. Which means that I’m basically eating what I make. And my family, who are happy to eat it, but I know it’s not really *healthy* to be constantly making desserts to eat. 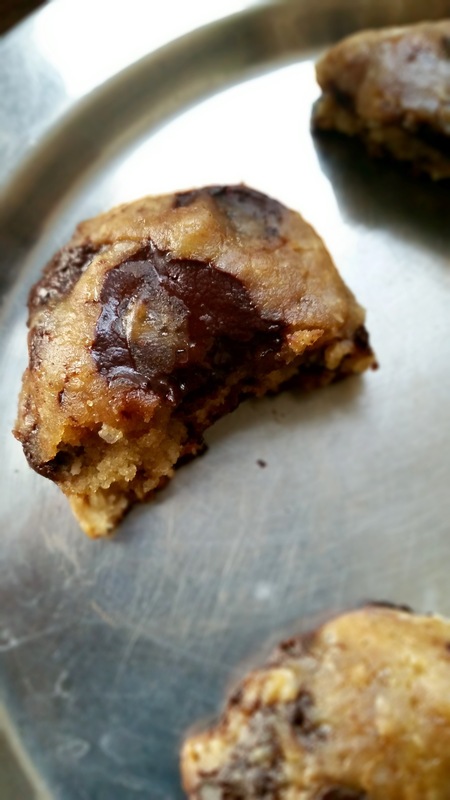 Subsequently, I force myself to look only at the cooking/savory sections of cookbooks and not think about potential concoctions of flour, cocoa, sugar, and fat du jour. Hah. So I think all these things. And then I find myself feeling a little cabin-fevery, freezing, bored, unfocused. 6 oz high quality dark chocolate (i used a mixture of Baker’s bittersweet chocolate bars, and leftover dark chocolate bars. I’m a dark chocolate fiend. There’s plennnty of sugar to round it all out, don’t worry). Here’s what *I* did, based on what I had on hand. Refer to original recipe for…well, the original recipe. Grease two 9 inch cakepans and dust with cocoa. Seriously. This will give it an amazing crunchy ‘crust’ (wrong word for cake but that’s what it is). In a glass bowl, combine the chocolate, 4 tbs cocoa powder, and 3 tbs water and set over a pan of simmering water to melt. Stir and melt chocolate until combined and melted. In a large, high-lidded bowl, add the avocado, 2 cups water, oil, 1 teaspoon espresso powder, the melted chocolate, almond extract, white vinegar, and the sugars. Tip: use an immersion blender to blend it all up, or food processor, or a whisk + strong arm muscles. Get that alllll good and blended. In a separate, large bowl, mix flour, flaxseed, cinnamon, baking soda, baking powder, salt. Add wet to dry and mix until just combined; don’t overmix even if there end up being little blobs of unmixed flour here and there. It won’t affect the taste or anything. Pour evenly into the cake pans (this is where having a kitchen scale reallllly comes in handy) and bake for 45 minutes. In a food processor, add avocado, dates, and banana and mix for a while until as broken down as possible. Then add the rest of the ingredients and adjust to taste. Put half the frosting on the middle layer, then put the second cake layer on top and frost the top of this. You really don’t need to frost the entire cake; the cake is supremely moist and delicious and you really won’t miss anything. Plus it lets the “crust” stay nice and crispy and delicious. Decorate with strawberries (I removed the stem, then I cut each in half lengthwise, then again, to make hearts!). Serve with some whipped cream if desired and more strawberries!! It was actually kind of funny, in a “what a funny coincidence” kind of way. Today, my parents took my brother back to school. I was working on some grad school stuff and then decided to take a study [baking] break as I am wont to do. 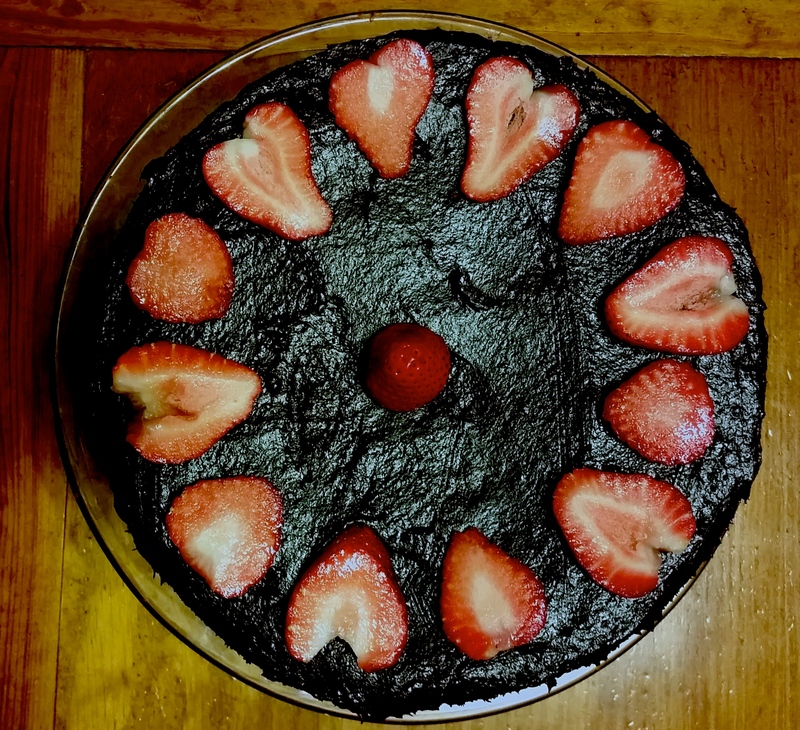 I made the cake (with only a few minor mishaps, including a little bit of a sea salt explosion and quick thinking of what I could replace almond meal with). I was thinking, how nice would it be to have some strawberries alongside? (chocolate covered strawberries are probably tied for favorite dessert in the world, the other being chocolate lava cake, and the other being strawberry short cake, and other being mint chocolate chip ice cream…) I decided I’d forgo them since we didn’t have any. I had just finished frosting the cake when parents walked through the door, my mom holding a Costco-sized container of strawberries! Since I’ll be in India for my birthday this year, my mom had been secretly planning to give me some early birthday presents tonight. 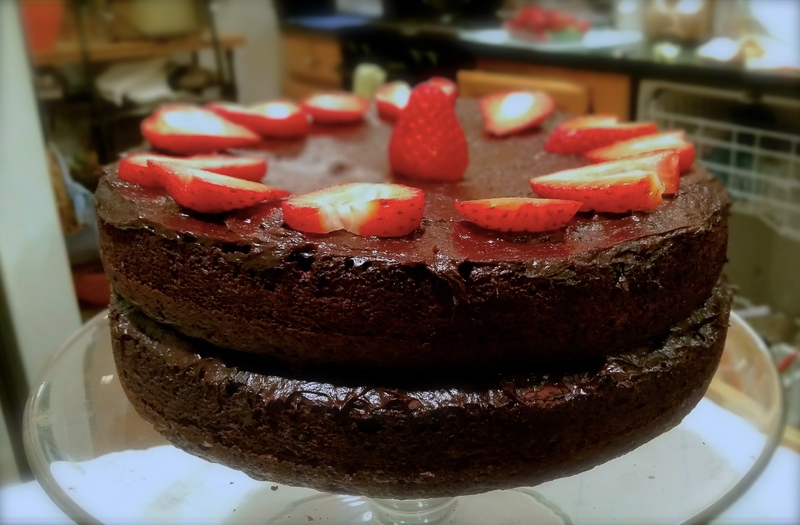 I had no idea but decided to bake a cake anyway… funny how things work out! This cake was like, I can’t even describe it, the freaking BOMB. Moist. Delectable. Crunchy, crispy edges, super moist. The frosting was the perfect consistency, and you can’t really taste the espresso but I think it definitely brought out the cocoa-y ness of the chocolate like it is supposed to do. Definitely recommend the strawberries as an accompaniment. You canNOT taste the avocado at all! It’s so, so, so, so, so, so good. I literally outdid myself. I really can’t believe how delicious it came out. Seriously, you’ll never need another cake recipe again. Drooling. Dying. Loving this. 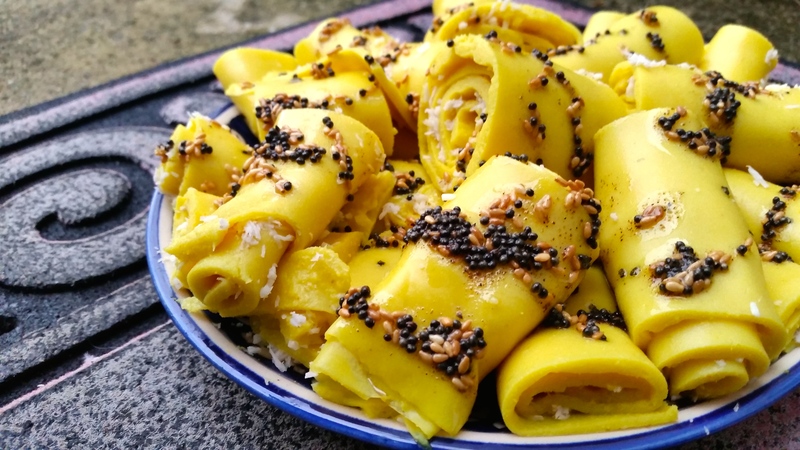 Khandvi is a simple, filling Guju snack made of dahi (yogurt) and besan flour (chickpea flour). It’s a rather novel texture, almost like a solidified custard consistency. It’s pretty easy to eat 5-6 of these at a time. 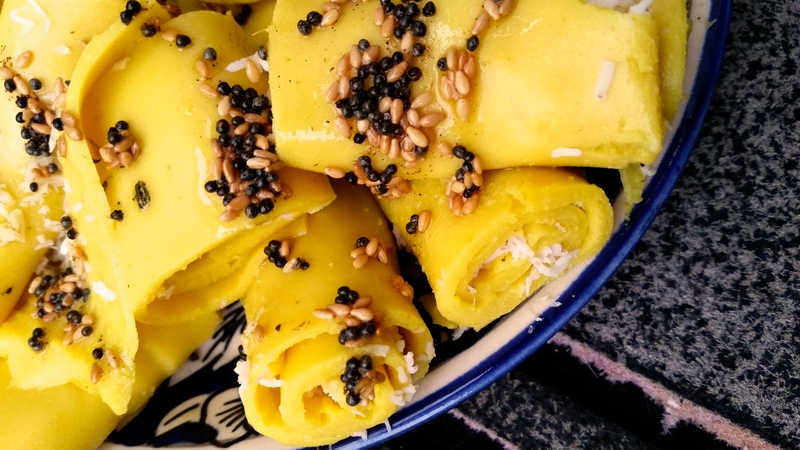 To make these, I used some haldi (turmeric) and mustard seeds I brought back from India. I was missing a few things (curry leaves, hing, etc) but they still came out delicious. Whisk together the yogurt and water, and then add the spices and mix. Add the chickpea flour and whisk until no longer lumpy. 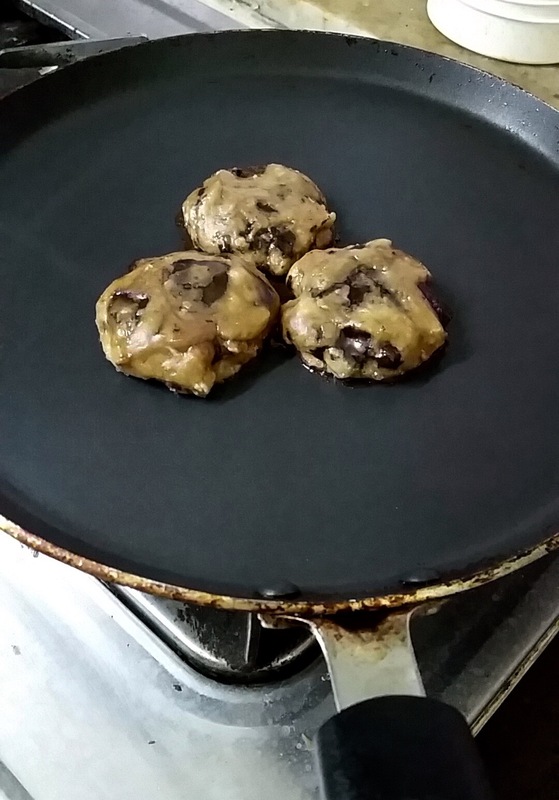 Spread some oil on two large, rimmed pans and set aside. Nonstick pans work even better. In a nonstick sauce pan on very low heat, heat the mixture until it solidifies. The original recipe notes it takes 17 minutes to reach the desired consistency, and this is about how long it took for me, too. To test whether the consistency is good, take a small spoonful onto the pan and let it cool a little, then try to roll it. If it rolls, you’re in the clear! Take the mixture off the heat and spread it out in a thin layer across the pan, as evenly as possible. Mix these together and sprinkle around on the thin layer of chickpea/yogurt. Heat oil and add mustard seeds, cook until sizzling. Add the curry and the sesame seeds, cook until sizzling/browned. Take off heat. Cut the yellow lengthwise into strips, and then roll roll roll. You can do a variety of shapes and sizes. 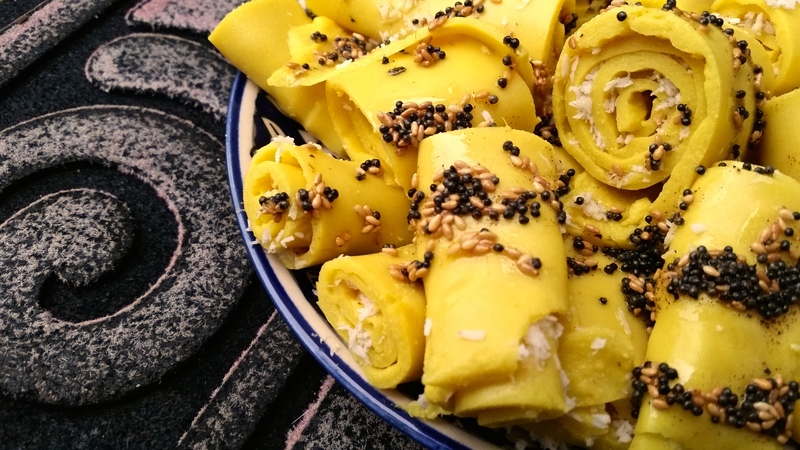 After rolling, arrange on a serving dish and spoon the mustard seed/sesame seed/oil mixture across them. I also sprinkled black sea salt for flavor and color contrast! Soft yet crispy, sweet yet savory, delicate yet filling. A snack of contrasts that won’t fail to please! Khana swadisht thaa! Also because I am a wimp I left out spicy green chilis. You can add these in the batter or in the filling if you so wish. I don’t really experiment with dried beans or lentils much, but I saw a little bag of mixed pulses in the store and it was just so colorful and pretty that I bought it. Thus, I had this bag of dried pulses and had to do something. 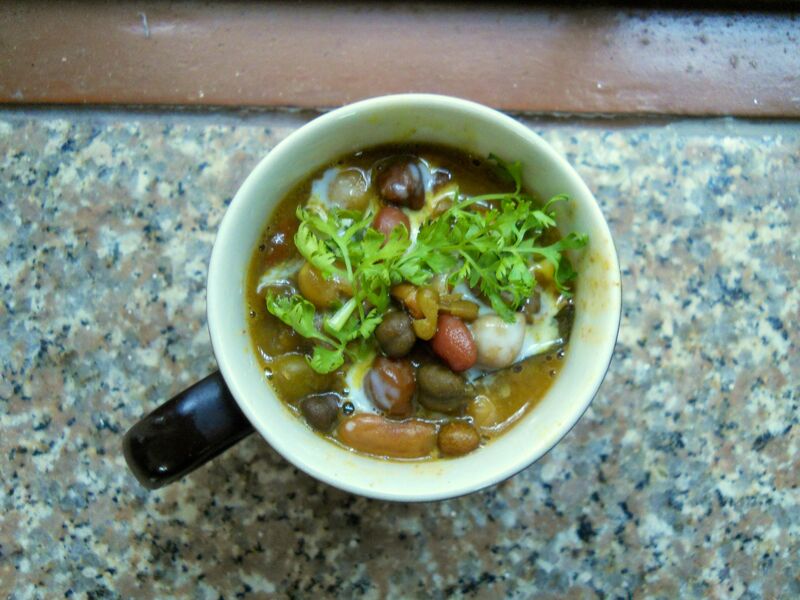 So, I made some soup! Perfect for the lovely 97 degree November days we’ve been having! 1 small bag of mixed pulses (see original recipe for exact amounts; the types and amounts don’t matter toooo much). 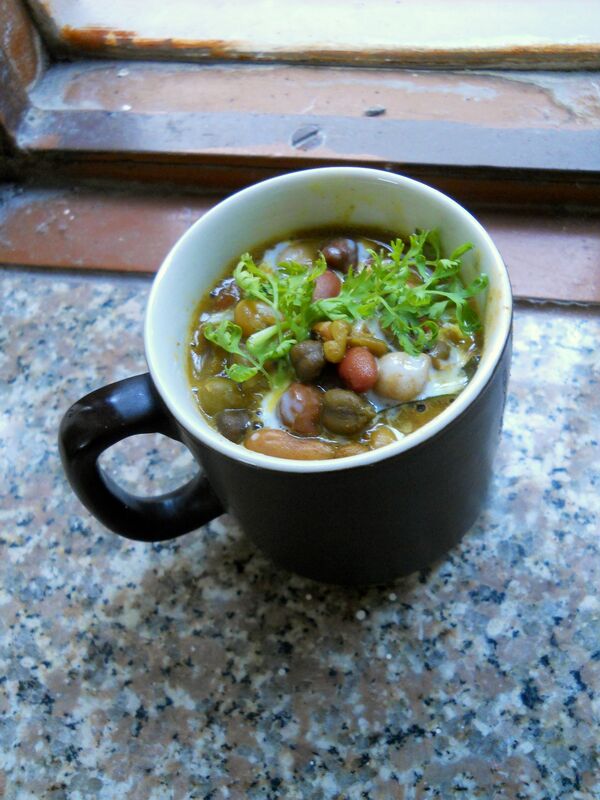 I had channa (chickpeas), some different beans, and some different daals (lentils). Soak the pulses overnight (this is why I don’t deal with dried legume stuff). Drain, and bring to a boil in enough water to cover the pulses with about 2 inches of water to spare. Simmer for about 1 hour. Mix together what I told you to mix together above. Heat your fat of choice in a pan and add the mixture in the bowl to it; saute for 5 minutes. Add the tomato, curry leaves, hing, and salt to taste. Cook and stir often for 8-10 minutes. Add this to the beans. Pour in the coconut milk and simmer for 20 minutes. Garnish with the cilantro and serve hot. Additional garnish: some extra coconut milk! Enjoy. Love me some fiber, protein… coconut… yum. This was pretty tasty and went very well with sweet potato parathas. 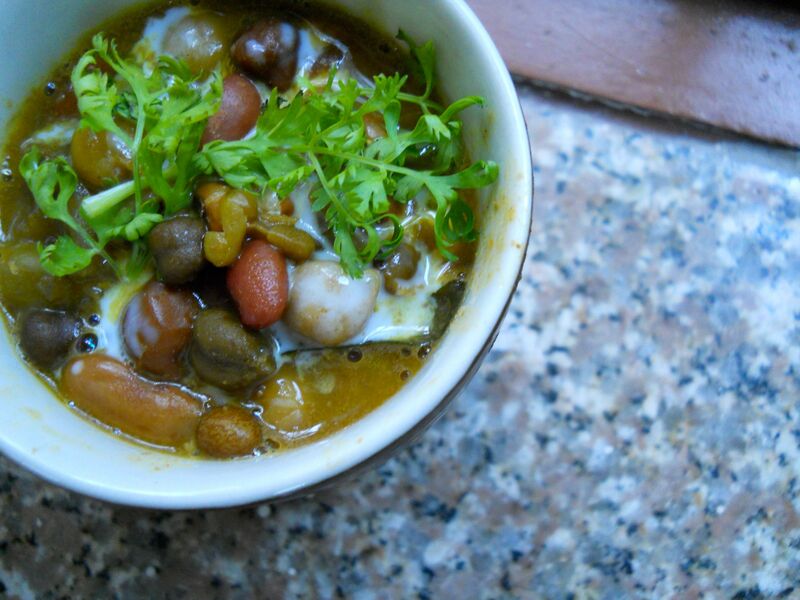 Other accompaniments would be some dahi (yogurt), or rice, or both, and a sweet lime pickle. 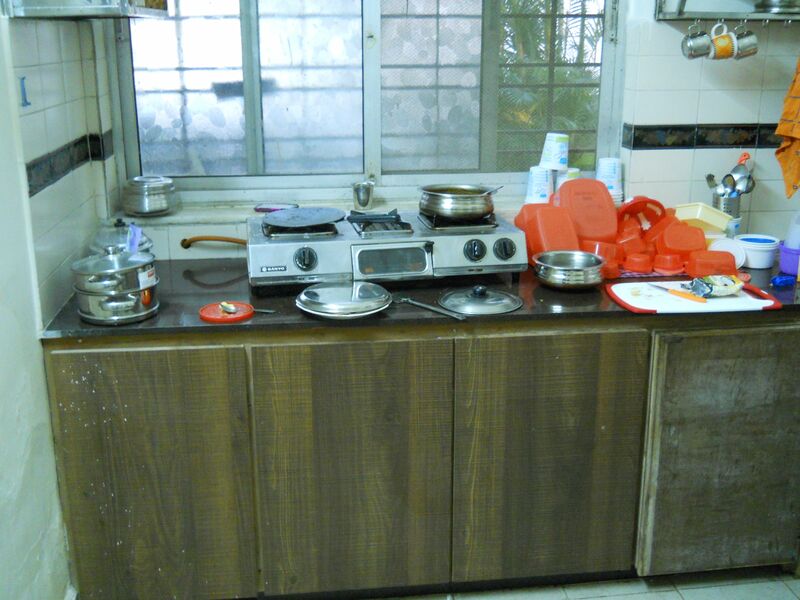 So many dishes, though… I can make such a mess in the kitchen. It’s kind of unavoidable especially with Indian food… or so I’ve found thus far. So that’s my kitchen, here in our little ground floor flat. Hope you like the soup. I recommend it. Mmm, parathas. Delicious breads fried in ghee and stuffed with stuff, be it aloo (potato), gobi (cauliflower), paneer (cheese), palak (spinach)… Or in my case, leftover sweet potato masala (sweet aloo masala?). First, the masala I used. 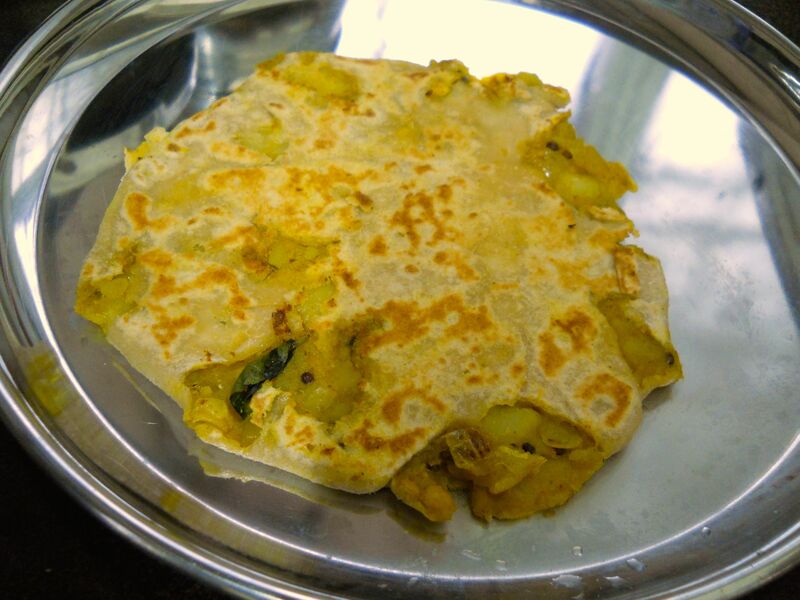 This is a rather unorthodox method of making parathas but don’t you worry, it’ll be yummy. Sweet potatoes: I used 4 and they were all varying in size and length. About 500 grams, peeled and cubed. Boil the sweet potatoes until fork tender. I accidentally overcooked them, making them mushy, which didn’t bode well for this masala on its own. 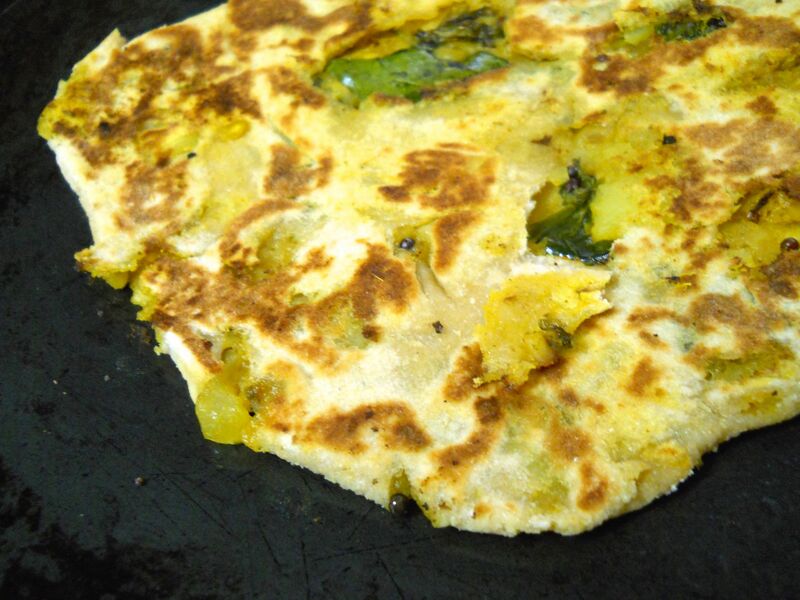 But as parathas… it’s perfect. Heat oil in a pan. Add mustard seeds. When they sizzle, add the cumin. When that fries, add the urad daal and turmeric. Add the rest of the ingredients and saute until the onion is browned and tender. Add the sweet potatoes and let it fry for 3 minutes ish, or until the sweet potatoes caramelize a bit. Dough: Combine 1 cup of whole wheat flour with a pinch of salt and 1 tablespoon of oil, and add enough water until a dough forms. Knead this dough and then let it ferment for 25 minutes under a dishcloth. After 25 minutes, divide the dough into balls and roll out into small rounds. Heap a few tablespoons of the sweet potato mixture into the center, and then take the sides of the round and bring them together on top of the stuffing, to make a little twisted dumpling. Roll this out again, and make a bigger round. 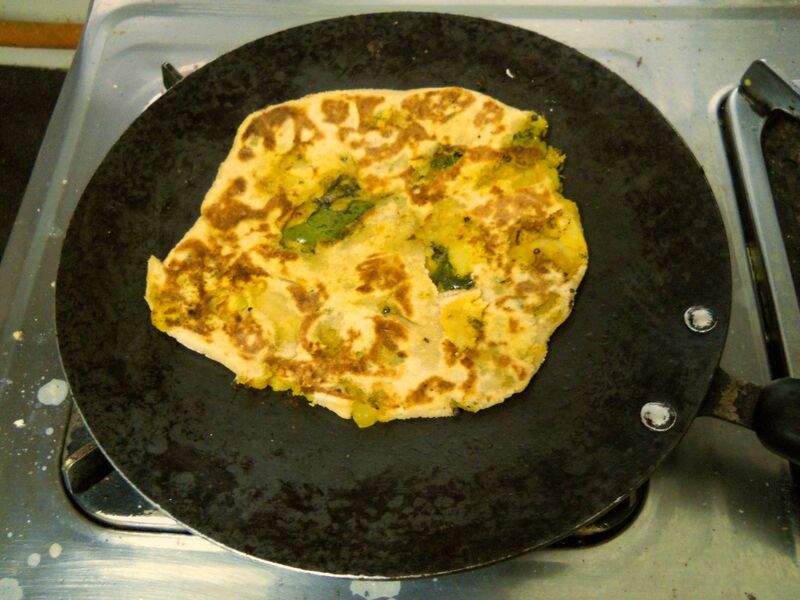 Spread some ghee over the surface of this and, on a hot tawa, fry until it gets golden brown in places. Spread some ghee on the uncooked side and flip and cook the other side. Ta da! Bear with me. This was my first attempt and it was a lot of fun. I don’t usually do step-by-step photos but the process was pretty cool (and messy). So after you make your dough, roll out a thick round about 3-4 inches in diameter. Spoon some of the prepared filling into the center. Do THIS! Make a little dumpling out of it. Take the sides and pinch them together. Then, you’re supposed to squish this and roll them out again, bigger, without actually tearing them. I didn’t really succeed at the no tearing thing. But: browned sweet potato innards = YUM. This was my best paratha. Soooo good. Probably one of my favorite cooking adventures so far. And, a plus, because the sweet potato masala I thought I messed up got a second life as paratha stuffing! Payasam is very similar to kheer. 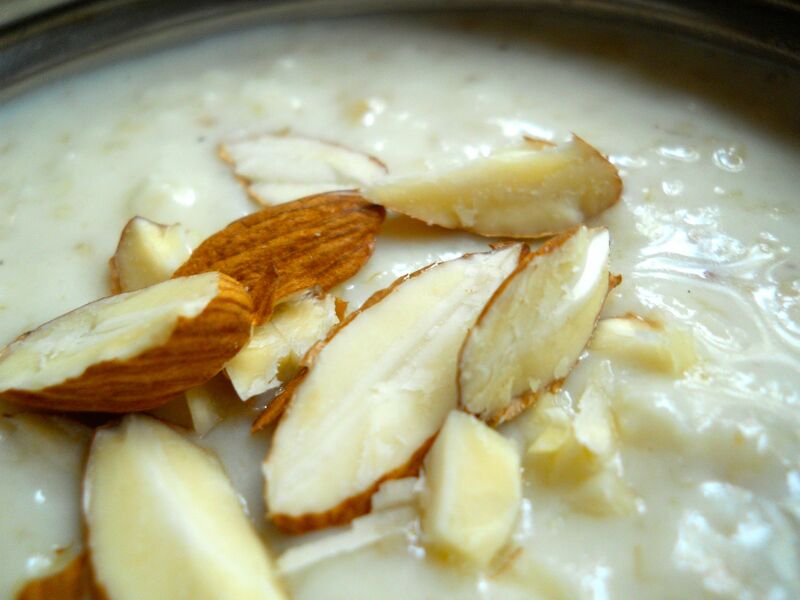 It’s called “kheer” in North India, while usually referred to as “payasam” or some variant thereof in South India. A lot of dishes are kind of like that: similar dishes, different names. Just to make things nice and confusing for the foreigner. But you get the hang of it pretty quickly! Anyway, a rose by any other name would smell just as sweet. And sweet, this is. Sweet and spicy and crunchy and smooth and creamy. Payasam (according to wikipedia) comes from a “peeyusham” meaning nectar or ambrosia… An accurate description. You’re probably wondering, ‘okay, what is this, whatever the name is! 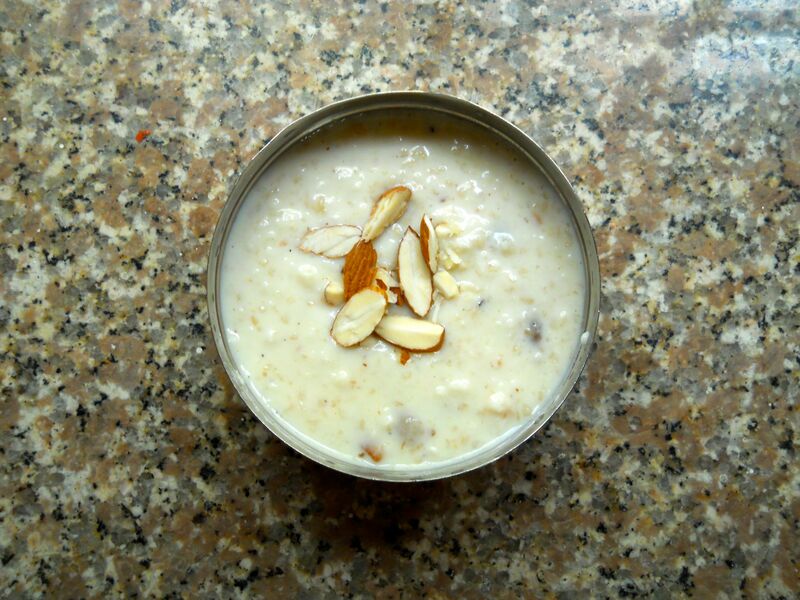 ?’ Well if you haven’t read my banana kheer post (shame on you), kheer/payasam is basically pudding/porridge made with various ingredients: usually some grain (or banana! ), nuts, ghee, sugar, spices and milk. 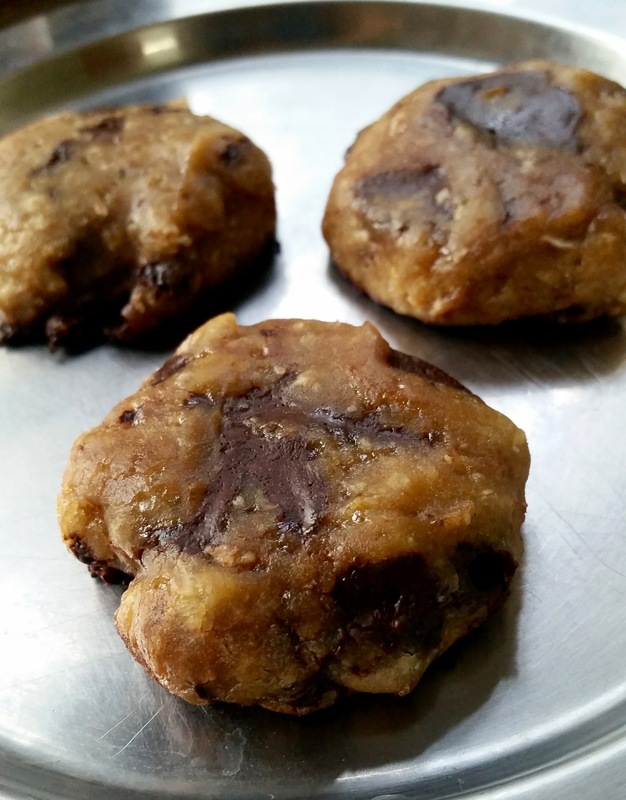 I got this recipe from VahChef at http://www.vahrehvah.com. His Indian cooking YouTube videos are hilaaarious and I highly recommend. 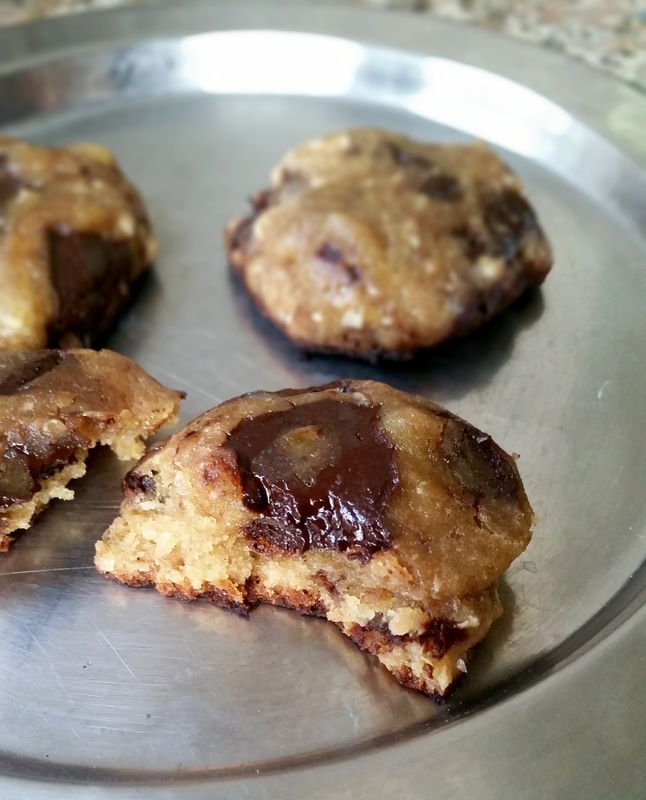 Sugar: I used 1 cube of jaggery and a sprinkle of granulated sugar. 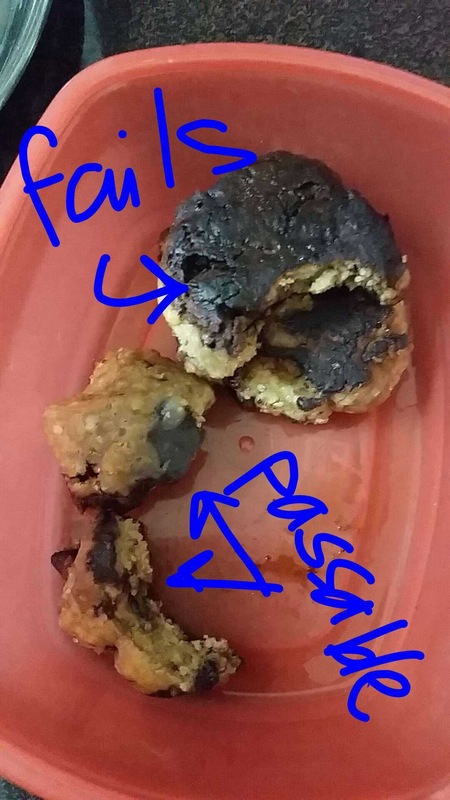 Original recipe says 1/2 cup sugar. Add to taste. Heat ghee in a pot, add cashews and raisins and fry until the raisins puff up and cashews are golden brown. Add the milk and water and cook on low heat for a while until the milk reduces and the mixture thickens. You can add more water to dilute if it gets too thick. Add sugar and let it melt; add the cardamom and take off the heat. Sprinkle almonds on top and serve, warm or cold. Or room temperature. It will basically taste yummy in any form. This was so good. I wouldn’t really mind eating this for breakfast every day. I gave some of this to my neighbors and landlords in return for goodies that they gave to me! I got good reviews from them, so let that be your guide and just go ahead and make this. MmmmMMm.